Salem is anything but your average town; its colorful and eccentric history is widely known across the United States and beyond. But what makes the place especially unique is how their historical journey is displayed throughout their town. Next to the beautifully preserved historic houses of Salem’s Peabody-Essex Museum, cars drive by, tourists snap pictures, and locals set up shop in their witch-themed stores across the street. It was truly an amazing sight to witness so many people going about their daily business right in front of three houses that have been around for centuries! Two of these houses were moved closer to the Peabody-Essex Museum to make way for more modern architecture to be built there instead. But this atmosphere did nothing to dampen the beauty of the houses; on the contrary, it seemed an even more interesting experience because of it. The first house that we explored was built in the 1600s, when Salem’s population was not very large. The house was very basic; the furniture was thick and wooden and it was clear that everything that was in the house was used to its fullest extent. Nothing was extravagant or impractical. The ceilings were low to keep the heat inside the house and the oven was in the most primitive form out of all the houses. It is incredible to think about how the citizens of Salem lived back then. Everything was so immensely different without our modern technology, and getting a glimpse inside this house was enlightening and interesting on so many levels. The Puritans lived a life of practicality and sensibility demonstrated by their house from the 1600s. And despite being surrounded by a modern setting, this abode still looks very much the same as it most likely did in the 17th century, which is a remarkable feat to accomplish. 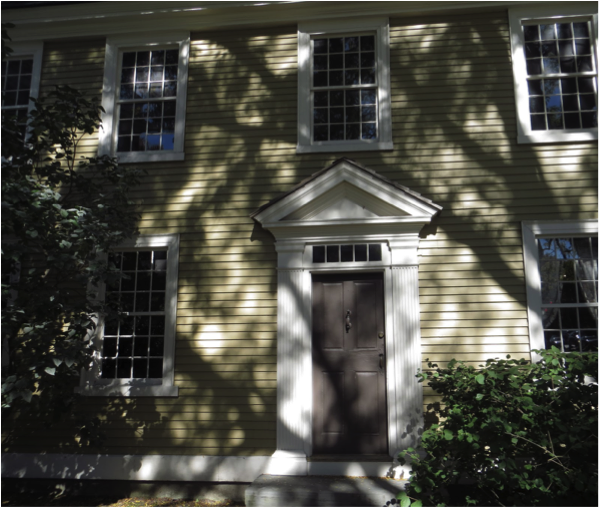 The second house was different than the first; built in the 1700s, this colonial did not possess the same solely practical objective as the first one did. The interior was more tasteful and pleasing to the eye. Not everything in the house was there for only one use. For example, the chairs were obviously used for seating people, but they were also high-backed and adorned, unlike the plain chairs that were seated around the simple table in the first house. On the tour, it was told to us that the house was originally a man’s but, upon dying, he left it to his widow who in turn had to rent it out to another family in order to pay for the house. And on the two different sides of the house it was clear to see the difference in years, tastes, and riches. The side that the second family lived in showed signs of greater wealth. Even inside one home, Salem still did not fail to display its lengthy history. Finally, the third house that was built in the 1800s was clearly and prominently the wealthiest house of them all. It was certainly the largest; from the outside, we were greeted by towering Greek Corinthian columns, a large wooden door, and intricate windows. Stepping inside was truly like walking straight into history. You could not help but feel awed and flabbergasted at the beauty and grandeur of the house. Every room screamed elegance and refinery from the parlor’s intricately carved staircase to the bedroom’s imported cotton bedspread. The owner of the house had become wealthy because of the triangular trade, and it showed through his home where international influence could be seen everywhere. In the kitchen and the dining room, Asian impact could be seen in the chairs that looked like bamboo and the delicate Chinese blue and white porcelain, enough for the whole family and more. All of this exquisiteness was found inside this one house that was on the threshold of a busy street in what appeared to be downtown Salem. The grace of the large and wealthy house contrasted greatly with the modernity completely surrounding it, which made the tour that more enjoyable. Entering the houses was like entering another world: the world of the past, the world of history. Real people resided in those homes, the people that we have read and about in our textbooks for so many years. The tour of the houses instilled a new perspective in me. When inside the houses, I could not think about much else besides how it looked, how it felt to be in there, observing things behind ropes or inside cases that were once handled normally by people of the past. Once outside, of course, the modern world came rushing back, jarring me awake from my historical visit. But this resulted in a special kind of aftereffect, a small epiphany on my part, if you will. The true allurement of Salem was the production of a town that was both contemporary and classical in many ways. It proved that the historical and modern world can happily coexist, which was, in my opinion, the most interesting aspect of Salem itself. Madeline Conroy is a junior at Clayton A.Bouton High School.